I have had my blog for around six months now, but I have been shooting for around three years. Therefore, I have a fairly extensive catalog of images that I have shot, but yet to share. Although I prefer to show my most recent work on this blog, I will occasionally go back and process some of my older photos in the event that I did not get the chance to go out and shoot during the week. 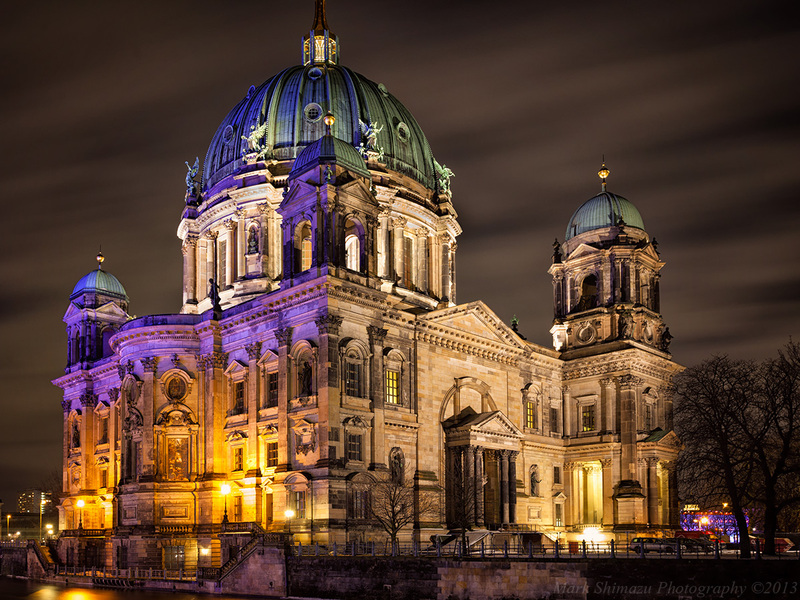 This shot was made in Berlin Germany around New Year’s Eve and is of the Berliner Dom. It runs alongside the Spree river and is in the part of Berlin called Museum Island, named for the many significant world class museums that reside there. Celebrating NYE in Berlin should be on everyone’s bucket list and I personally have not experienced another party quite like it. The first shot was made from the east bank of the Spree river shooting south west towards the Cathedral. When I can, I like to shoot the Canon 17-40mm f/4 USM in the middle of the zoom range. Generally zoom lenses are weakest at their extreme ends (in the case of this lens at both 17mm and 40mm) and it is best to avoid those focal lengths if maximum sharpness is desired. Also, this lens has particularly soft corners (as do almost every zoom in this range) even at f/8 when using either the extreme wide focal lengths. For this shot I used 29mm and an aperture of f/8 to maximize sharpness since I wanted to capture all the fine detail of the Cathedral. A shutter speed around 60 seconds was perfect in being able to capture the fast moving clouds as streaks overhead. The purple lights that you see reflecting off of the Dom are from the Radisson Blu hotel, which sits directly across the Spree river. The purple lights nicely complement the tungsten street lights of the Cathedral itself, and it was this visual that attracted me to make this shot. The second shot was made shooting eastwards towards the front of the Cathedral. It was taken the night prior to shot number one. Here you see no vibrant lights, but almost a monochromatic image. This is further accentuated by the thick low clouds over the area. The thick low clouds also allowed the TV tower to be hidden. You can barely make it out on this photos directly behind the Cathedral. On a clear night, the tower takes over the composition due to the intense red lights that emanate from it, so I was actually fortunate to have the cloud cover. Again, to maximize sharpness, an aperture of f/8 was selected. This gave a shutter speed of 15 seconds, but since there were no interesting clouds in the sky unlike in the first photo, it was not an important aspect in getting this shot. Thanks for the comment and your continued interest in my posts! Love your blog. I look forward to your next post. Thanks Pat. Looking forward to new flower shots on your blog. I like the smooth and seamless sky from the first shot. It isolates the Berliner Dom and makes it “pop”. For the second shot, I think the vignetting is very well applied here. Overall, I love the detail and lighting of both shots. Great work, Mark! Thanks. 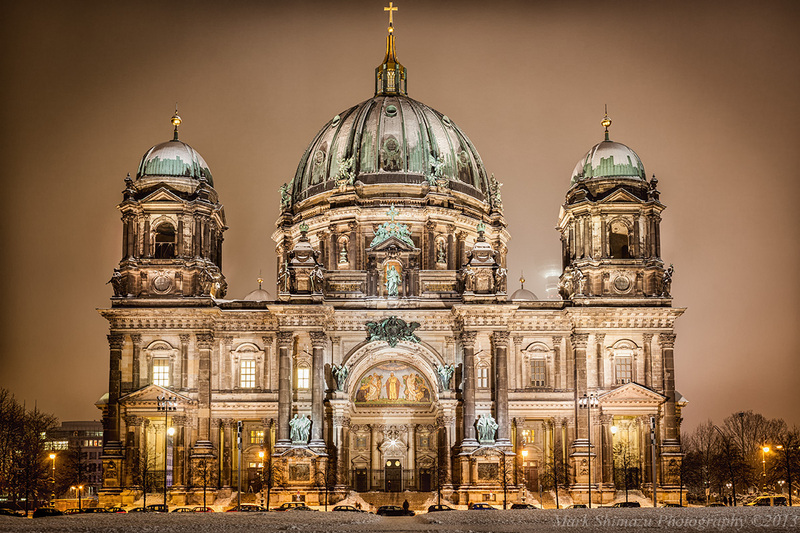 It is hard to take a bad shot of the Berliner Dom. It is such an exquisite and detailed building. Both shots are worth viewing and the commentary informative. I’ll quickly say well done…. I think I like your first the best. Thanks for stopping by and sharing your thoughts. I struggled with which shot I should have put as my “title” shot. Both are wonderful images! If I had to choose I would pick the first image as a favourite, but I don’t have to choose. I get to look at both so that is a good thing. But I particularly like that you write us your thoughts and reflections on the pictures. This is very helpful for me. Thanks. One of the parts of photography I enjoy is sharing with people what I have learned. I am glad you found value in this, it makes my efforts worthwhile. Excellent photos Mark! The detail and lighting are stunning! Amazing ! The colours are superb and I love the clouds ! Thanks. I am going to visit Germany again soon. Hopefully I will be able to come back with some more photos I can share.